Wednesday, 14 May 2014: One Year and Forty Four Days Old. Ayla is sooo close to walking, she’ll become a toddler any day now. If I’ve said that before, I know, but I was wrong then because now I see how close to walking Ayla really is. Just in the last few days Ayla has learned to stand up by herself unassisted, and to me she looks really quite stable and solid. Ayla’s also started walking while we hold her hand; only one hand instead of two! And, Ayla can now pick something up off the floor and stand holding it and playing with it without a single wobble. Although Ayla isn’t quite walking yet, she’s definitely started climbing and this morning I caught her on the tray of her high chair! 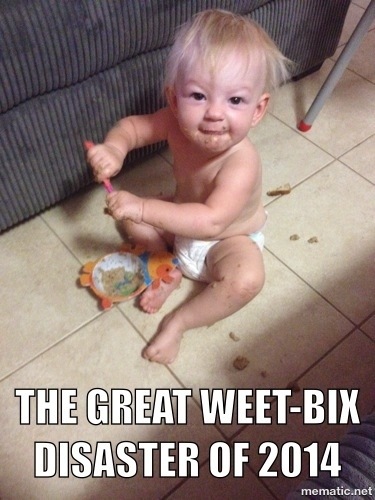 (Hence why she are the rest of her breakfast on the floor as shown in this photo). Apparently the average age for walking nowadays is 14months (even though I walked at 9 months nearly 30 years ago) so the sooner Ayla starts toddling about the happier I’ll be… I think!